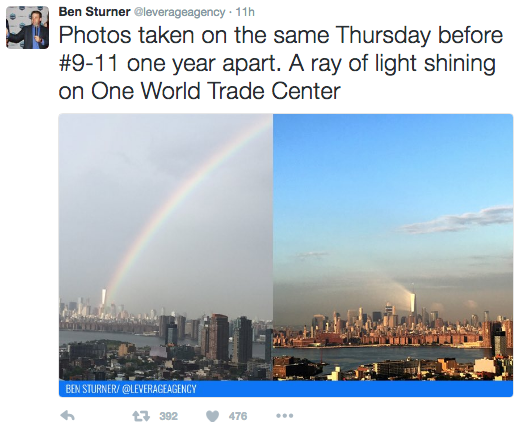 Ben Sturner, a New York City resident and self-titled amateur photographer, has captured a photo of “weird, reflective light” shining off One World Trade Center just days before the anniversary of the 9/11 terrorist attacks. Sturner claims that he looks out at One World Trade Center everyday from Long Island City in Queens but has never seen anything quite like this. He witnessed what is being called an “angelic light” that is “the beaming light of all the angels from 15 Septembers ago” shining off the iconic skyscraper. 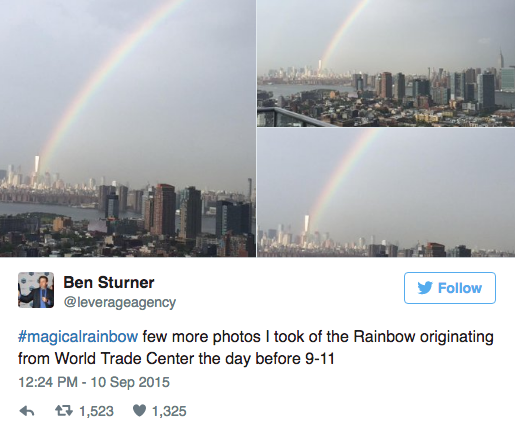 Sturner posted the photo to Twitter at 8:41 am and it went viral almost overnight. It has been shared thousands of times and viewed by hundreds of thousands of people. This isn’t Sturner’s first brush with internet fame. He also captured another photo of One World Trade Center that went viral only days before the 14th anniversary of the 9/11 attacks. Sturner says that the support he has received from people on Twitter and other social media channels has inspired him. Several people have retweeted their appreciation and support for the amateur photographer. Be sure to follow Sturner on twitter at @leverageagency for more amazing photos of the One World Trade Center that are sure to follow!